Knowledge - Guinea in your home | Viden.io - Search your interest in the world's first crowd-sourced Knowledge Repository. r other guinea pigs. Your initial thought is that if you buy this special pig, you'll be rescuing it, and therefore it's a good thing you chose to buy a guinea pig at a pet store. Really, the best thing you can do is to actively avoid supporting that pet store so that hopefully some day it won't exist and those animals won't be treated that way, especially when there are literally thousands of guinea pigs in shelters that need homes. Supporting pet stores that mistreat animals is the perfect example of an easily avoidable, but all-too-common mistake for new owners. The "cages" they use are usually aquariums that aren't big enough for even one pig, but often house three or more at a time. These practices are no secret and have been a problem for years. If you are interested in owning a guinea pig, the best thing to do is to adopt. A rescue that is specific to small pets like guinea pigs will know how to care for a cavy more than any pet store will, guaranteed. Guinea pigs that come from pet stores aren't cared for as well, and are likely in a worse state of health. Your local rescue will also be able to answer any question under the sun regarding your newfound pet, which might not be true of the 17-year-old working at the pet store. Another good thing about adopting? You can easily find cagemates, so it eliminates the entire "introducing a new pig" dilemma. My guinea pigs are brothers who have been cagemates for life, and I received a two-for-one special because the woman who rescued them knows how important it is for cagemates to stay together. Her husband was a vet, so I knew that when I adopted these two baby boars, they would be at optimal health. After over three years, we still stay in touch and she asks how they are doing from time to time. You can't find that kind of care in a store. But what if you want a young guinea? Don't worry, there are thousands of guinea pigs of all different ages waiting for homes at shelters and rescues (and don't rule the mature pigs out until you meet them). If you assume that you can only get a fresh new guinea at a pet store, you might want to think again. This is another common misconception about guinea pigs. A lot of people think that owning just one pig is fine, and that it doesn't need a friend. This may be true if you have enough time to give it the attention it's lacking from a cagemate, but most people have jobs or school. Imagine if you were left to spend an entire day in a confined space. Would you survive? Of course, but it'd be a lot better if you had a friend with you. Guinea pigs are very social animals. They are also a prey animal, so no matter how many hours you spend hanging out with your guinea pig, I'm sorry but your guinea pig would still rather hang out with another guinea pig. Humans are scary to piggies, while other piggies are protection. "Ew but two guinea pigs would smell so much more!" No, not really. If you have an appropriately sized cage for two pigs, your cage will not smell any worse than your current cage does. I've owned one pig; now I own two, and I don't notice a difference in odor at all. What I did notice is that it is much more fun to have two pigs than just one. Why? Because watching them interact, seeing their differences in personalities, and catching them cuddling together is much more rewarding than looking at one pig with a blank look on its face who is terrified of me. If you bought a cage from a pet store, it's probably too small. Even if you splurged on the biggest cage in the store that cost over $100, not only is your cage probably still not big enough, but you also wasted a ton of money. The best way to ensure that you are getting an appropriate cage for your cavy is to build your own guinea pig cage. This is much easier than it sounds and much more cost effective than trying to buy a cage that is big enough. For the price you paid for your cage from the pet store, you could have built what's known as a C&C cage triple the size. The C&C stand for cube (the wire storage cubes you can assemble with plastic connectors) and coroplast (corrugated plastic). 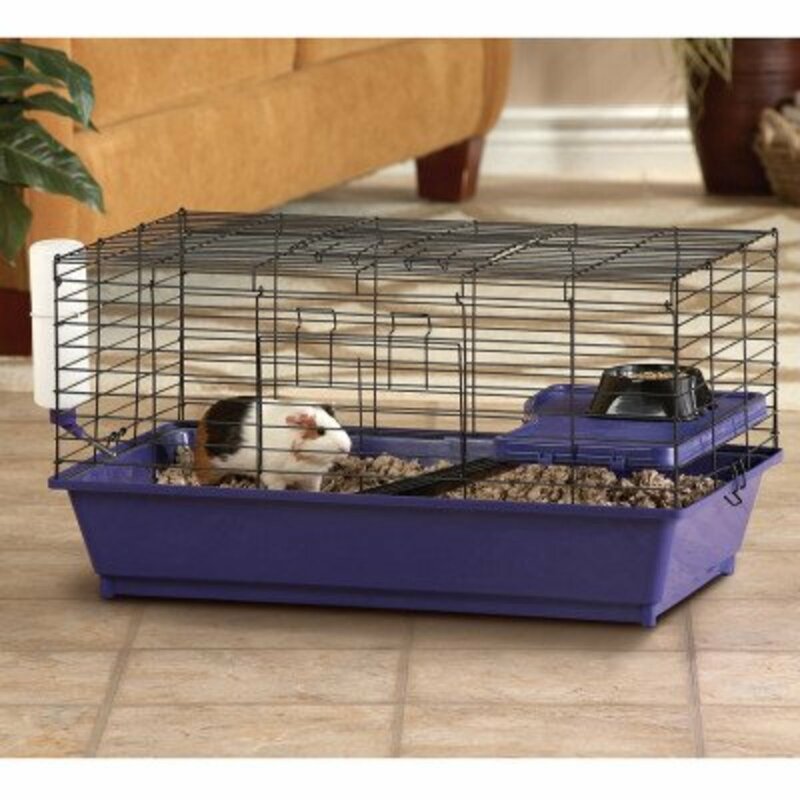 Some may look at an appropriate cage for a guinea pig and think that it is way too big, but if you look at how an average-sized guinea pig compares to the size of an average store-bought cage, you can see it'd be like keeping a hamster in a shoebox. Would you keep a hamster in a cage the size of a shoebox? Just because it can turn around and take five steps doesn't mean it's an acceptable size. Exercise is a necessity for the longevity of guinea pigs, just as it is in all other living things. If a Labrador was kept in a pen that was only big enough for it to take a few steps each day, most would consider it animal abuse, so why is it okay to give that same treatment to a guinea pig? If you have male guinea pigs, the preferred size acts as more of a requirement than a suggestion. Boars often tend to fight more, and therefore require more space to have alone time. A rule of thumb is basically the bigger the cage, the happier the pet. Pellets: Dry food, or pellets, come in all different types, brands, and prices. Most of the pellets you will find in stores are ones that should be avoided. This articlegives an in-depth discussion on what to look for, and what not to look for in guinea pig pellets. Popular brands used by guinea pig experts include Oxbow Cavy Cuisine (my favorite, which can be found cheaper online than it can in stores), and pellets sold by KMS Hayloft. Hay: Your guinea pig needs an unlimited supply of hay at all times. Oh, the wonders of hay—guinea pigs need it for many reasons. Their digestive systems require a high-fiber diet in order to keep things running smoothly, if you catch my drift. Not only that, but their teeth are constantly growing, and chewing hay keeps the growth of their molars under control. Piggies love to eat hay, sleep in hay, play with hay—everything. If a guinea pig made a Valentine's Day card, it would be to hay. When you purchase your pig's new best friend, look for second-cut Timothy hay. Second-cut means that it's the second cut of the season—the first cut tends to be tough, so you want the second, more tender, batch—and Timothy hay is a type of grass grown specifically for hay. You can get hay in stores (not the best option), online (much better option), or from a trusted local Timothy-hay farmer (the best!). Start stocking up and spoiling your pig with ample amounts of hay; it will be greatly appreciated. Fruits & Veggies: Guinea pigs should get a wide range of different fruits and vegetables every day. It can be fun to see what different fruits and vegetables your pig prefers. My pigs' absolute favorite vegetables are carrots. Follow this detailed nutrition chart from a popular guinea pig website to see what vegetables and fruits are acceptable, as well as appropriate serving sizes. Sugar-filled, wacky-flavored, colorful guinea pig treats are not good. There are probably appropriate treats through brands such as Oxbow, but a general rule of thumb is that if you aren't positive about how good it is for your pig, don't buy it. Some people try to sell hay balls that go in your cage and act as a movable hay rack. These have been known to be very dangerous to pigs because piggies get their little feet stuck inside them. If a pellet food looks delicious to you, it's most likely bad for your pig. Look for plain pellets. Avoid any with mixes of seeds, nuts, and weird-colored shapes. Never feed your pet iceberg lettuce. It is not nutritious and can cause diarrhea. The greener the leaf, the healthier the lettuce. Salt wheels = bad. If you feed your pig high-quality food such as Oxbow, it already has enough sodium in its diet. 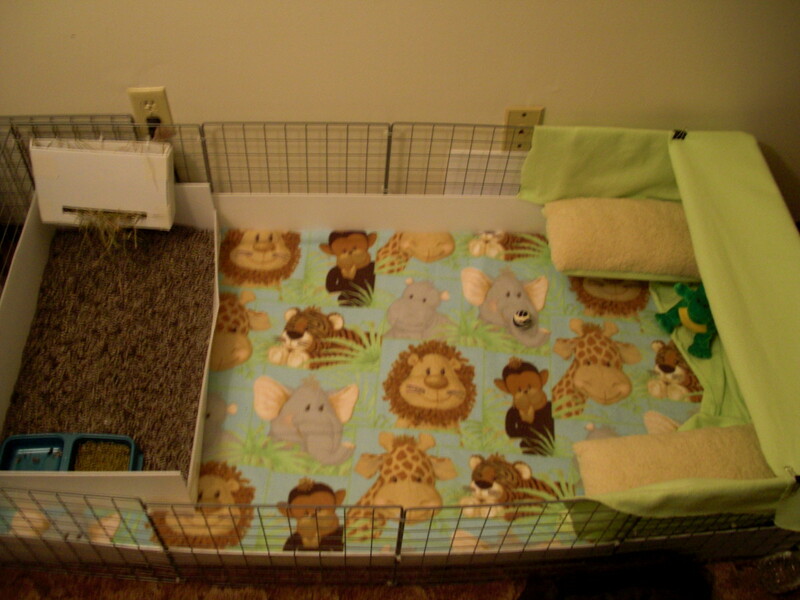 One of the most common types of bedding used in guinea pig cages is in the form of wood shavings or paper-based bedding. This is completely fine if you are using the appropriate kind (not pine, cedar, or sawdust). However, wood shavings may not be the best choice for the health of your piggy. Small bits of wood, paper, or dust inhaled by a guinea pig may cause respiratory problems or bother its sensitive eyes. Wood shavings and paper-based bedding can be kicked around easily, and isn't the cleanest option because your guinea pig will be living in its own waste until you completely clean the cage. Although many people use wood- and paper-based bedding, it isn't a very eco-friendly choice, and it can get crazy expensive. This leads me to my next tip: the magic of using fleece bedding. 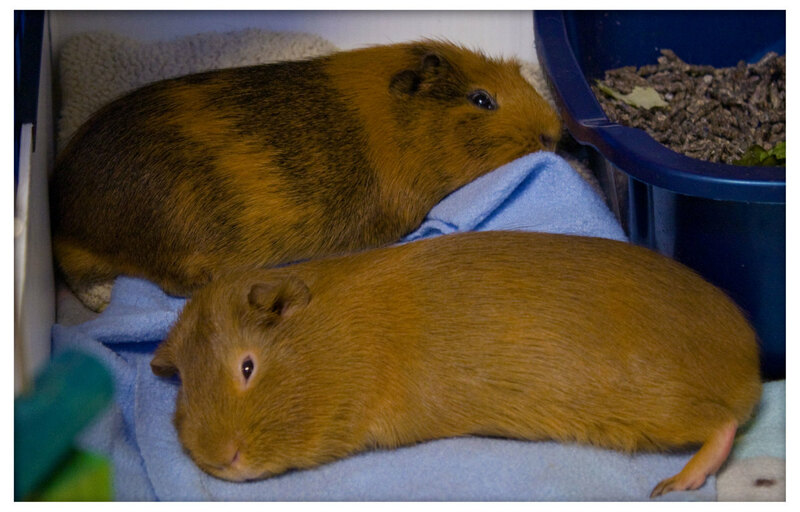 Fleece is a newer bedding option that has been sweeping the cavy nation. It is cheaper than any other option and more eco-friendly. Using fleece allows you to "spot clean" your cage daily, so your piggy can literally live in a poo-free world if you want. Instead of absorbing urine like paper or wood bedding would do, thus becoming soggy, fleece allows it to pass straight through (underneath the fleece, you should have two layers of a towel or something similar that you will have to wash periodically), so the top layer is left completely dry to the touch. It doesn't hurt that cleanup's a snap and your cage looks better either.